The Deck Department of the cruise ship consists of the ship’s personnel responsible for the navigation, safety and security of the ship, and also the non-mechanical portions of the ship. The Engine and Hotel Departments make up the other two sections. The Deck Department is responsible for everything related to the operation of the ship. It includes the Captain, the officers on the Bridge, and all of the maintenance personnel. The Department is also responsible for the maintenance of the lifeboats, the outside surfaces, and the open decks. They also clean public areas, too. 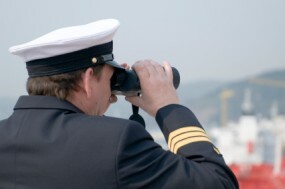 Most upper level positions require extensive training and/or experience – and some of it must be on a cruise ship. Entry-level positions are often available, especially if you have some specialized training, and cruise ships often promote from with their own ranks.